Of the world's major Digital Single Lens Reflex (DSLR) and Mirrorless interchangeable lens camera (MILC) manufacturers, only Nikon DSLRs have utilized XQD memory cards to store images and videos. Some Sony video cameras also use XQD cards. 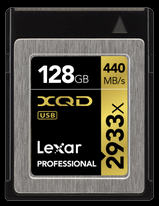 XQD cards were manufactured by Lexar and Sony, until June, 2017, when Lexar announced that they were discontinuing their retail memory card business, including XQD memory cards. Since then, only Sony has been manufacturing XQD cards. The XQD card was created for high-definition camcorders and high resolution digital cameras, as it offered considerably better performance than Compact Flash memory cards, even CFast cards. While Nikon bet on XQD cards, their competitors bet on CFast memory cards. Today it's clear that Nikon won their bet. Frankly, based on the different cards' specifications, I don't understand how CFast supporters thought they'd win their bet. Let's take a look at the two cards and their potential. The XQD interface is PCIe, while the CFast interface is SATA. PCIe is a scaleable interface. SATA is not. As a result, the speed of SATA cards is capped at about 600MB/second, while PCIe's speed can top 1,000MB/second or more. That's because PCIe data moves in “lanes” and manufacturers can add additional lanes to gain more throughput per second through the PCIe interface. Another benefit to PCIe is backward compatibility. It saves users from having to through away their investment in older XQD memory cards. It can also allow firmware updates to permit devices to use newer cards. In the future, new DSLR and MILC cameras will undoubtedly need faster and larger capacity memory cards to handle video past the current 8K (UHDTV) standard. In addition, as photographic sensors pack in more and more pixels, in order to keep continuous shooting speeds at ten to twelve or more frames per second, faster memory cards will be necessary. CFast can't provide the speeds needed for the next generation of DSLRs, MILCs and video cameras, while XQD technology can. Hence the battle between the two memory card standards was over before it started, though apparently few understood that. On September 7, 2016, a little more than a year ago, the CompactFlash Association (CFA) declared the end of CFast when they announced the new CFExpress family of memory cards. CFExpress memory cards are PCIe Generation 3 based and have a maximum theoretical interface speed of 1.0GB/second per lane of PCIe, much faster than CFast's speed limit. In addition, the CFA announced that they were immediately concentrating on “2 lane” and “4 lane” form factors. A two lane CFExpress memory card would have a theoretical maximum speed of 2.0GB/second, 3.33 times the top speed of CFast memory cards. I said unsurprisingly because CFA has indicated that the CFExpress form factor will be identical to the XQD form factor, a very strong and robust package for camera memory cards. CFExpress was huge news for Nikon and Sony users who have already invested in XQD cameras and video recorders. First, the XQD slots in Nikon and Sony cameras can readily accept the new CFExpress memory cards. Canon, on the other hand, with their CFast memory card slots are incapable of utilizing CFExpress cards. Second, existing XQD based cameras will be able to utilize the CFExpress cards inserted into the XQD slots if a simple firmware update would be provided. At the PDN PhotoPlus Expo last Friday, October 27, 2017, in the Nikon Professional Services (NPS) Suite at the Jacob K. Javits Convention Center, along with two other NPS members, I discussed the future of Nikon's existing XQD based DSLRs with an NPS team member. NPS told us that Nikon is committed to issuing a firmware update for existing cameras with XQD slots, which will make them compatible with the first generation of CFExpress memory cards. Therefore, Nikon DSLR users that use XQD based DSLRs such as the D5 and D500 will be able to purchase compatible memory cards for quite some time. As new Nikon upper end cameras come out, after CFExpress cards are available, Nikon will undoubtedly move to the XQD upgrade, CFExpress memory cards. Since 2012, with the introduction of the Nikon D4, using XQD memory cards, Nikon stood alone among DSLR manufacturers in seeing the future. Five years later, everyone knows they made the right choice by using XQD memory cards in their high end DSLRs, and will continue making the right choice by moving to its upgrade, CFExpress memory cards in the future. Wow, talk about great news. My D5 will live even if my current cards don't. Great news. I've got a D5 and was concerned when Lexar pulled out. Nikon is listening to their customers a lot more than a few years ago.